Chief Arvol Looking Returns for a visit to the Northwest. Chief Arvol Lookinghorse the Keeper of the Sacred White Buffalo Calf Pipe. Come share a moment with Chief Arvol Looking Horse and his message to Humanity. Chief Arvol Looking Horse will be returning to Salish Country to share his message Peace, Love and our responsibility to Unci Maka (Mother Earth). 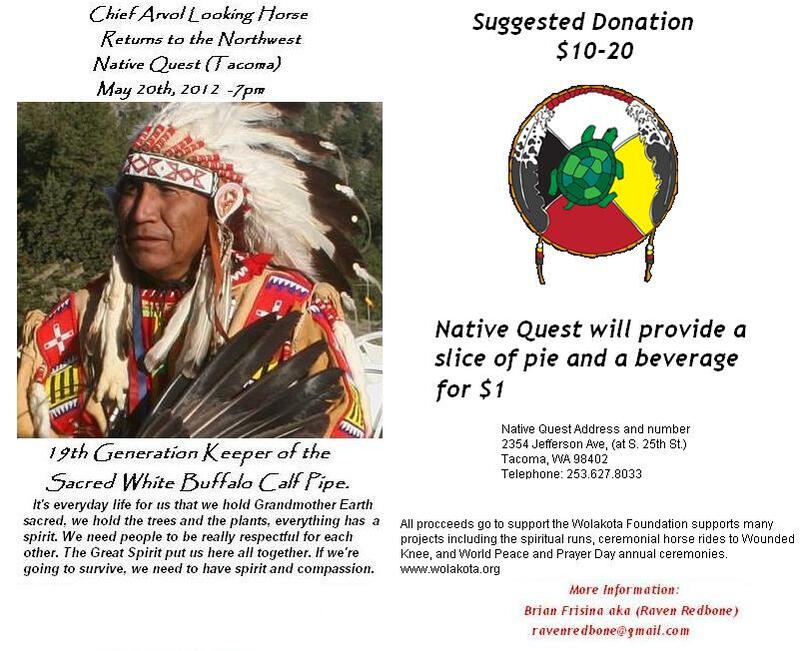 Chief Looking Horse will be speaking at Native Quest this May 20th, Sunday at 7pm. The New Earth Agreements 2012 & Beyond. Come & learn how you can walk in love, peace & harmony. This entry was posted in Events and tagged Chief Arvol Looking Horse, Choctaw, First Peoples, Indigenous, Native Quest, Raven Redbone. Bookmark the permalink. hi, what is Native Quest and where is it?